My family moved to 1 Claremont Row from Argyle Road in 1948; at the time I was three years old and my brother was one year old. 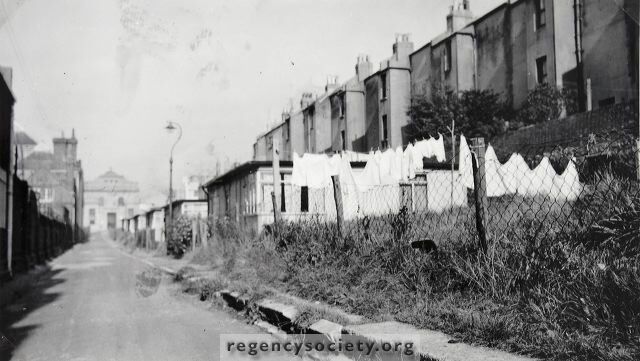 On Claremont Row there was a line of eight or ten prefabs, across the street from the Ebenezer Chapel, and opposite Richmond Street Infants’ School. The school also housed the Brighton Headquarters of the NTC, The Nautical training Corps; the basement was laid out end to end as a ship, with a quarter deck and even a shooting range for 303 Rifles. 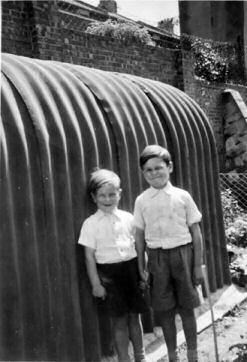 My brother and me in our garden c1950. The Anderson shelter in the garden a left over from the war was now a garden shed. Above us at the back was a local shop and dairy, it was run by a family called James.They had moved from the corner of Claremont Row during the slum clearance. I remember they had a Greyhound called Mick, that used to scare me and my brother half to death. He guarded the shop and we had a large surround garden with a link fence that he could clear in one bound. The garden at that end was built up from a lot of rubble left over from the clearance of the original buildings that made up Claremont Row. My dad once thought we could level that end of the garden, but he gave up very quickly when he discovered tons of rubble just below the surface. Luckily it was only that end, so it just became a play area. We stayed in the prefab until the final clearance of the whole area. My mother always said it was her happiest home. Of course the prefabs were originally constructed as temporary homes, but they lasted for years and everyone who lived in them, loved them. We had a proper bathroom and indoor toilet, at a time when that was still uncommon. Did you ever live in this area? Do you remember the prefabs? Or maybe you remember Richmond Street School? If you can share your memories with us, please leave a comment below. I too lived in a similar prefab to these, but it was one of five or six in Viaduct Road Brighton. I remember the smell when we moved in. Distemper, or was it asbestos? I am still trying to find out the construction of these prefabs. Happy times there though after the war, 1948/51. My father was an auxiliary fireman, the fire station being at the end of the road at Preston Circus. There was a bell in the hall which went off at all times of day or night! I remember catching the No 5 bus at Preston Circus to go to my junior school in Patcham. Miss Honeysett was the headmistress. Imagine allowing a 7 year old now to cross all those roads at Preston Circus to get to the London Road stop going north! 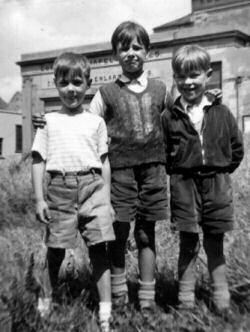 We, the Sharps, moved to Claremont Row when I was 3 in 1955 with my older sister Theresa and baby sister Sharon. My name is Ian and we lived there until 1959. I remember the people from No.12 – boys older than me whose dad had a car. I also remember a family called the Durrants who lived at No.2 and had lots of daughters. We lived at No.3, then there was the Smiths who lived at No.4. I think a Polish family lived at No.6. If you have any more photos of that time, I would love to see them. I do remember you Trevor and Mick the greyhound, and my Gran whacking it with her broom when it chased her cat down below her basement grating. Good ole days when we were that age! P.S. I’m top left in that 1950 school photo you added to this site.